Cardiff City, with its Castle, and associated Castles at Caerphilly and Castell Coch, is a magnificent example of the sensitive marriage of old and new. The conversion of Cardiff Bay into a cultural, administrative, sporting and maritime centre is a triumph. The National Assembly Building for Wales stands beside the Wales Millennium Centre (home of the Welsh National Opera) and the Wales Millennium Stadium - venue for the Rugby World Cup and many important football events. 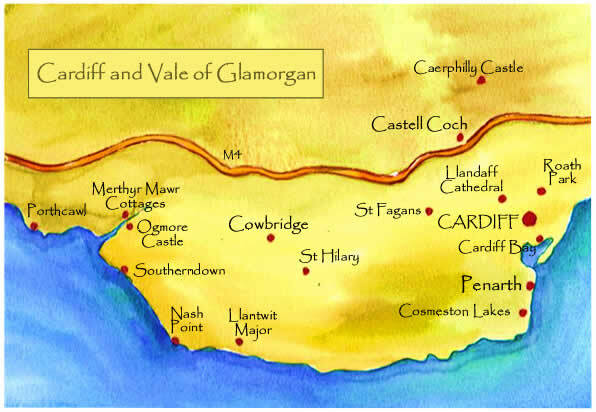 Very close by, in total contrast, is the Vale of Glamorgan, with its tranquil countryside, market towns such as Cowbridge (where I used to teach physics), Llantwit Major and the beautiful Heritage Coast. See Books section for information on my book 'An Artist's View of Cardiff and the Vale of Glamorgan'.